The 18th Annual Old Time Base Ball Festival was held this past weekend (August 1-2, 2015) at Old Bethpage Village Restoration. It was a great event as ballists and cranks alike enjoyed the beautiful weather and entertaining games. A highlight of the weekend was the announcement that the Festival would be renamed in honor of Doc Adams. 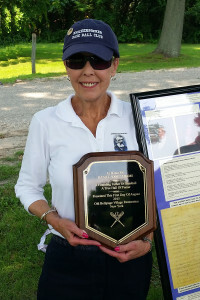 Marjorie Adams was on hand to receive a plaque commemorating the event and shared her knowledge of her great-grandfather’s accomplishments and contributions to the game.